HAMDEN, Conn. – Loren Gabel’s celebratory smile spoke volumes. 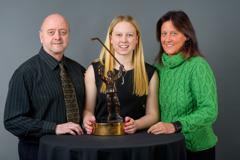 The Clarkson University senior joyously clutched the prestigious trophy on Saturday following her selection as the 22nd winner of the Patty Kazmaier Memorial Award during a lively and occasionally emotion-tinged ceremony. 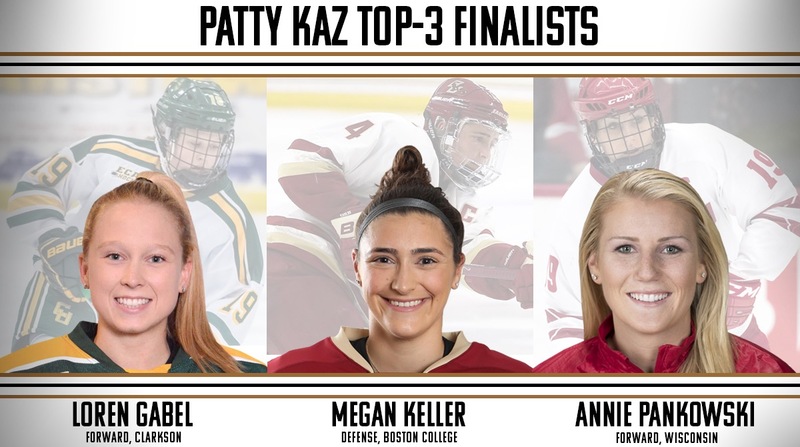 Gabel, who closed out the regular-season campaign with a nation-leading 34 goals, including nine of the game-winning variety, edged finalists Megan Keller of Boston College and the University of Wisconsin’s Annie Pankowski in the voting. 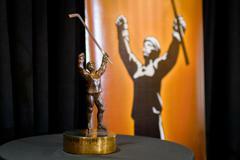 Previous winners have been a virtual who’s-who of the nation’s leading Division I players, with selections based on their on-ice performances, character and humanitarian contributions to their respective communities. Gabel proved to be one of the sport’s most dangerous offensive players this season. All the while, she also adheres to a vigorous volunteer schedule. Among her volunteer work is working with the Potsdam Elementary School’s Smart Cookies Enriched Program, the Active Souls project with Special Olympics and the Potsdam Community Outreach Clean-Up, as well as visiting the Sick Kids Hospital in Toronto. 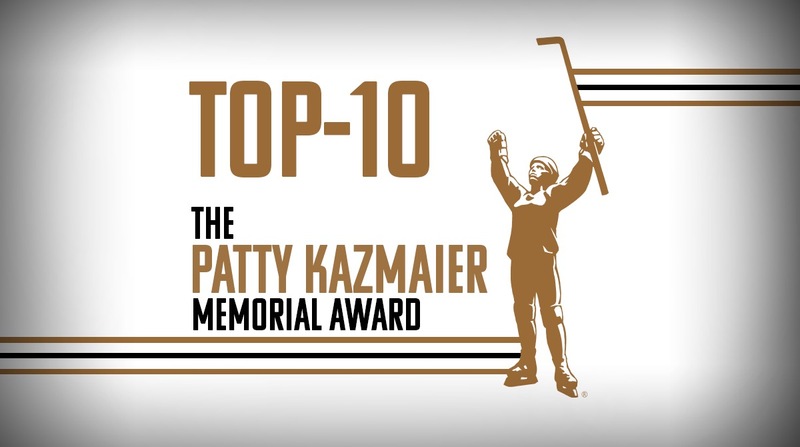 The late Patty Kazmaier’s daughter Serena Veazey opened the program with a perspective on the impact of the award on the current women’s game. This year’s finalists epitomized how far the sport has come. Keller, a 2018 U.S. Olympian, was the nation’s leading scorer among blueliners with 41 points on 18 goals and 23 helpers during the regular season. The Farmington Hills, Mich., native remained active within the community, volunteering at the Perkins School for the Blind, Newton Special Athletes and the Food for Families program. 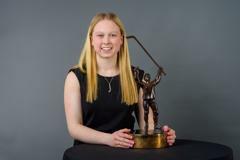 Pankowski, 2019 Hockey Humanitarian Award finalist, WCHA Player of the Year and now a 2019 NCAA Division I national champion, had 17 goals and 30 assists on the season. She volunteered in excess of 2,000 hours with Occupaws, an organization that raises guide dogs. The Laguna Hills, California, native also became an ardent visitor at UW Children’s Hospital during her time in Madison. However, it was Gabel who came out atop the voting on Saturday. She finished the regular season with 210 career points, the most of any player in Clarkson history. 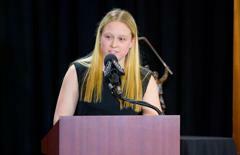 “I could not have done without the help of my teammates, coaches and the support staff, they’ve all been incredible and helped my development on and off the ice as a player and person,” Gabel said. Gabel, who also had a school-record 113 career goals going into the postseason, previously won her second ECAC Hockey Player of the Year Award. Desrosiers, who directed Clarkson to a program-record 36 wins a year ago, noticed his forward’s penchant for dealing with life challenges. 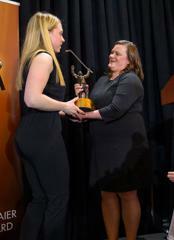 In addition to her individual accomplishments, Gabel led Clarkson to plenty of team success, including four Frozen Fours and national titles in 2017 and 2018.